Windows 8 boasts with a modern look and features including new Metro UI, Start screen and Lock screen etc. Well! Many criticising the new Microsoft for removing the Start menu and booting into the desktop instead of Desktop.The Windows 8.1 update brings the start button back where it is before but not the menu. Hey! Microsoft you disappointed the millions of users again. Personally I like the start screen and removal of the Start menu. However Microsoft messing things again with bringing back the Start button. Now Let’s move to the topic of how to Customize the Windows 8 Lock screen. What is Window 8 Lock screen and apps? The lock screen of Windows 8 is only displayed when you boot into the system or when the computer is sleeping. Unlike the Android home screen, Windows 8 lock screen won’t have any apps in it. But you can get the basic information of date and time, Windows 8 app notifications and updates, and event updates from your calendar. Lock screen apps are basically running in the background that show the updates and notification when windows 8 shows lock screen. For example: When you play the Windows 8 Radio App Audials first time, the app will ask your permission to run in the background. How to Customize the Lock Screen with Lock Screen Customizer? 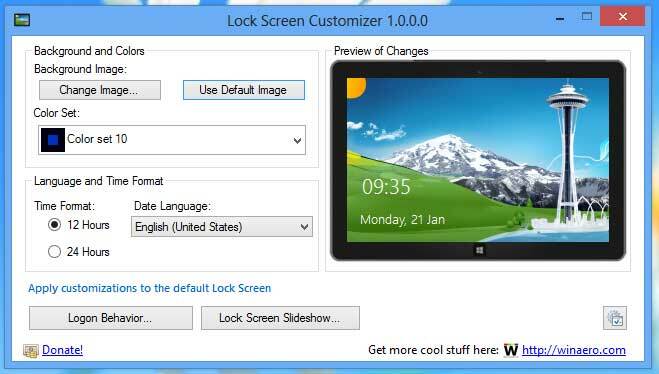 By default Windows 8 offers customization settings for lock screen. By clicking the Change PC Settings in the charms bar bottom settings. In personalize, You can add lock screen apps, choose which info should be displayed there. Also, you can change the background Wallpaper of the lock Screen. But the options are limited. The lock screen customizer allows you to tweak and extend the options for Lock Screen. Change the time format, date language, color set and lock screen background by using this tiny lock Screen Customizer. By default Windows 8 Sign out screen only shows that green Seattle picture. Now you can change the Default Lock Screen background which you see when you sign out with this tool. Lock Screen Slideshow is the other Great feature of this application. Enable the Lock Screen Slideshow feature and get the new lock Screen background wallpapers every time you sign in to the Windows 8. It is pretty cool feature.! Add Lock Screen Slideshow with auto changing background images every time you sign in.